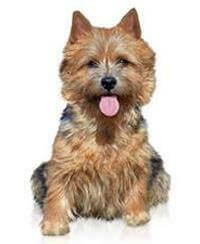 The Norwich Terrier is a native breed to Norfolk, England, although they are called Norwich Terriers. This lovable and feisty little dog was first registered with the British Kennel Club in the 1930s. There are two similar breeds, one with drop ears, and one with pricked ears. In 1964 the British Kennel Club divided the two breeds and we now know them today as Norwich Terriers (pricked ears) and Norfolk Terriers (drop ears). The life span of the Norwich is 12 – 14 years, but some have been known to live up to 15 years.